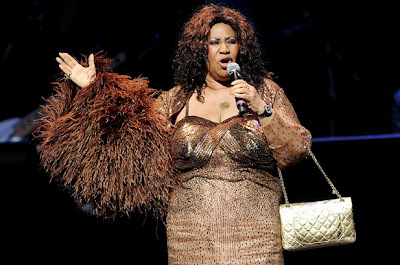 The legendary Aretha Franklin was honored at the Apollo's Spring 2010 Benefit and Concert along with the late King of Pop, Michael Jackson. Hollywood power couple and natives of New York Jennifer Lopez and Marc Anthony was also honored for their humanitarian efforts with the Ruby Dee & Ossie Davis award. The Queen of Soul, Aretha Franklin shined in a gold dress and flowing locks of curls. Jamies Foxx begged her to sing a song and she wowed the crowd with an unrehearsed "Rock Steady" with the house band. Aretha, shared how she first learn how to curtsy while performing at the Apollo theater.